Almost exactly 20 years later, Winfrey is reportedly considering a run for president after delivering an electrifying and widely praised speech at Sunday’s Golden Globes ceremony. Some Democrats are ecstatic at the notion while others are already groaning at the thought of replacing the current occupant of the Oval Office with another celebrity. 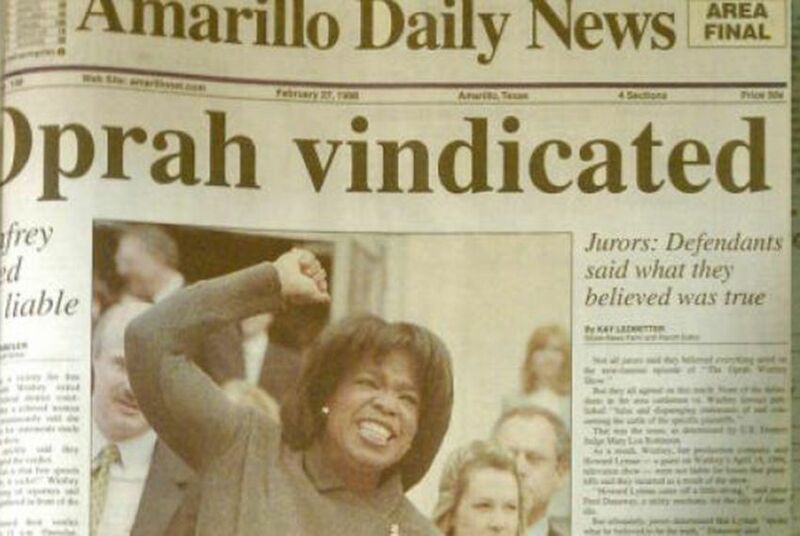 Winfrey’s Texas beef began in April 1996, when her talk show aired an episode on food safety. A segment included discussion of bovine spongiform encephalopathy, commonly known as mad cow disease, which had recently killed cattle in England. Howard Lyman, a vegetarian and animal rights activist, predicted on the show that the disease would eventually plague the U.S. beef industry. Winfrey declared that the discussion “has just stopped me cold from eating another burger. I'm stopped." The segment, which also included a clip from a beef industry expert, was widely viewed as having contributed to a drop in cattle prices. Members of the cattle industry were furious, as was one of their biggest cheerleaders, U.S. Energy Secretary Rick Perry, who was then the Texas agriculture commissioner. Within days, Perry wrote a letter to Texas Attorney General Dan Morales, urging the state to take legal action against Lyman under a Texas law that was less than a year old. Throughout the early 1990s, about a dozen states adopted “veggie libel” laws that made a person liable for making false statements about the safety of food. The Texas Legislature passed such a law in 1995. Charles Babcock, Winfrey’s lawyer for the case, at first thought the suit could be handled fairly quickly. But it soon became clear that the plaintiffs were dug in and Winfrey, who had defended her 1996 episode as fair, would never agree to settle. Not only did the case involve one of the world’s biggest celebrities, but on the other side was an industry that was a massive employer in the region. Babcock remembered feeling he had his work cut out for him. Bumper stickers reading "The only mad cow in Texas is Oprah" had popped up around town, along with T-shirts sporting Winfrey’s face and a red line across it. “It’s still on the books,” Babcock said, “but to my knowledge, nobody has used it since that case."